The mid-sized sedan market is the most competitive segment in the auto industry with 2 million vehicles sold per year, and Nissan has ridden the popularity of the Altima to second place in the annual sales war. 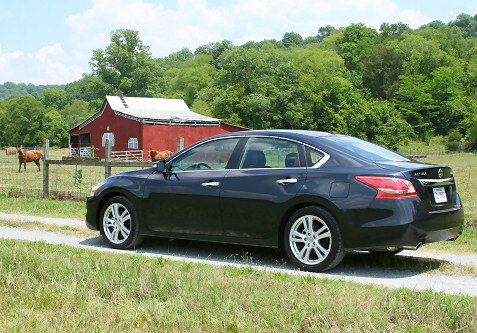 We were invited out to Nashville to test drive the next generation Altima that will go on sale this summer. With a fresh new look and 38 MPG on the highway, the new Altima should do just fine in this segment. This is the first of five all-new models that Nissan will be introducing in the next 15 month, representing 70% of the company’s sales. The new redesign is striking and will definitely grab your attention. Nissan is phasing in a new front grille that began last year with the new Versa, but the grille on the new Altima is much more stylish, with the curved edges that takes some cues from Nissan’s Infiniti line of luxury cars. With the wrap-around headlights and the new grille, the Altima features a more aggressive front end, which is then matched by an equally stylish rear end with its LED taillights. The new Altima looks great from all angles and should compete well with the flood of new vehicles in this segment. Nissan’s designers worked on making the interior more comfortable, with more soft padding on the doors and the new NASA-inspired “zero gravity” seats. Research by NASA on a natural, stress-free posture measured in zero-gravity influenced the design of the new seats, with the goal being an increase in blood flow, decreased muscular load and lower fatigue. I can’t speak to those specifics but the seats were certainly comfortable during our drive. The overall feel of the interior was modern and comfortable. If you choose a leather interior, you’ll find perforated leather and a woven headliner along with a leather steering wheel that feels very comfortable to the touch. It definitely creates the upscale feel Nissan was shooting for. It feels like you’re cruising in a luxury sedan when you try the decked out model with the V6. The new Altima is also very quiet with a significant noise reduction from the previous model. The technology package offers some nice features including NissanConnect, 7” Touchscreen, Navigation, Google POI, Google Send-to-Car and Blind Spot Warning. It also includes two new firsts for this segment – Lane Departure Warning and Moving Object Detection. I had the opportunity to drive both the 2.5-liter 4-cylinder version and 3.5-liter V6. The next generation CVT (continuously variable transmission) worked fine in both models. The CVT has been improved with 70% of its parts redesigned, an expanded gear ratio, 40% friction reduction and improved control logic. The result was seamless acceleration and a more natural feel in CVT mode. Still, I liked how the Sport mode simulated the gear shifting sensation we’re used to from traditional automatic transmissions, and naturally it also provided more acceleration. I also liked how the Sport mode option is conveniently placed right after the “Drive” slot on the center console. You don’t have to search around for it and shifting in and out of that mode is very easy. But acceleration is fine in the standard CVT mode as well and this is where you’ll get the best gas mileage. The Altima boasts 38 MPG on the highway with the base 4-cylinder which is best in class and should be a big selling point. Weight reduction was an important factor with greater use of ultra high strength steel and aluminum. With a 79 lb weight reduction Altima has the lowest weight in the segment. The overall driving experience was very impressive. I’m partial to cars with some power so I loved the V6, but the base model also performed well. This is an excellent vehicle that should continue to be a hit in this segment. The styling is impressive and should appeal to both men and women, and both the base engine and the V6 offer solid performance. The base model starts at $21,500 with the excellent gas mileage, and 3.5SL with the v6 and all of the options tops out at over $31,500. With the decked out V6, you start to rival the perks of a luxury sedan for a much lower price, particularly with the new technology package.